Start a new measurement from here (in case you drove here by a different route.) Take the road that heads downhill to the north side of the main crest. A sign on the top says "Polystopos 5", in this direction. At kilometer 1.9, keep right. You are going downhill and enter a village. At kilometer 3.8, go sharply left, this is in the middle of the village. 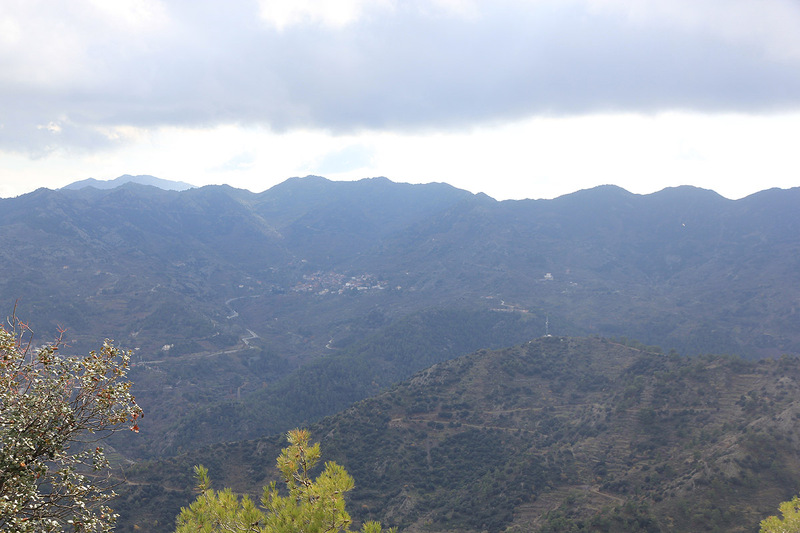 Then at kilometer 5.6, just as you leave another small village, leave the main road and go left up a hill. Shortly, at km 5.7, turn right. Then at km 6.5, continue straight ahead. Finally, at kilometer 7.1, turn slightly left (uphill), then go straight at the fork that follows immediately. Continue along the road until it hits a col at kilometer 8.2, with parking on the left. There is a sign informing that you are at the E-4 hiking trail. This is the trailhead and parking, location N34.96106, E033.02228, elevation about 1125 meter. The trail is E-4 going right as viewed when approaching the trailhead by car. There is a large sign on the very first little knoll. 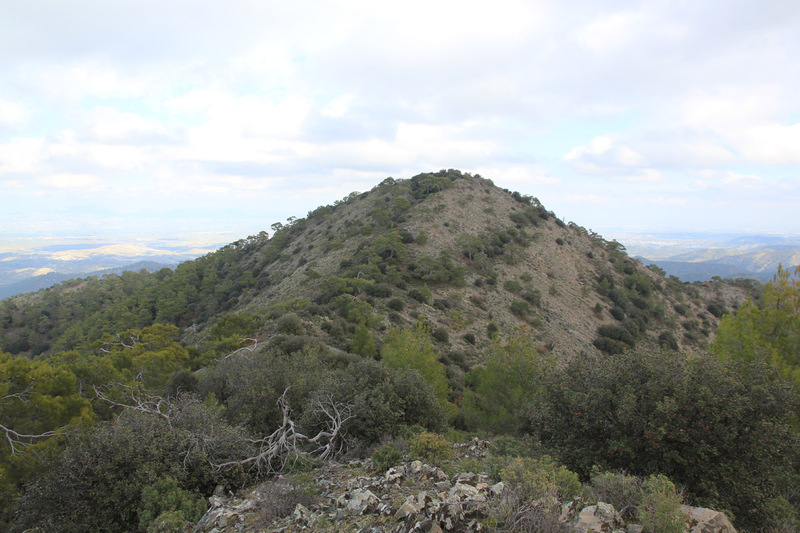 The trail runs along the ridge and descends to a local saddle at location N34.96496, E033.02422, elevation approximately 1092 meter. From here, the trail ascends and eventually crosses the crest (from right to left), this place has a nice wooden bench for resting. From here, there are two choices. 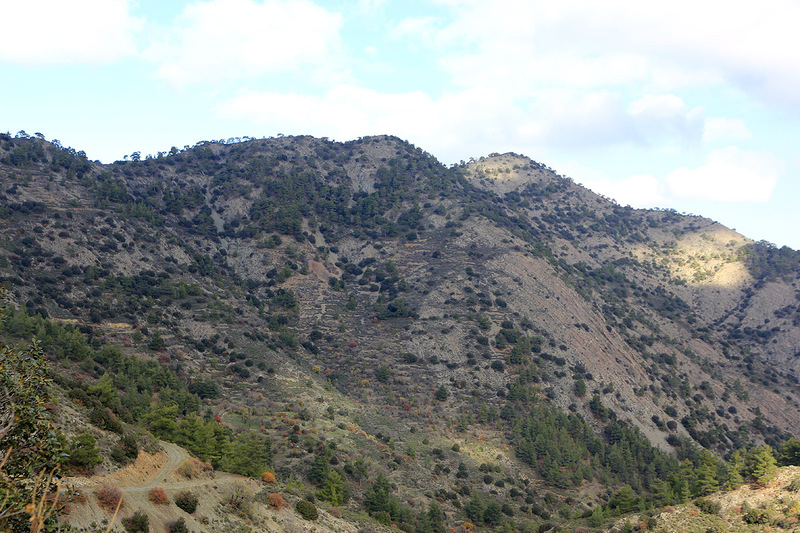 Option 1 is to leave the trail here and hike uphill along the main ridge. 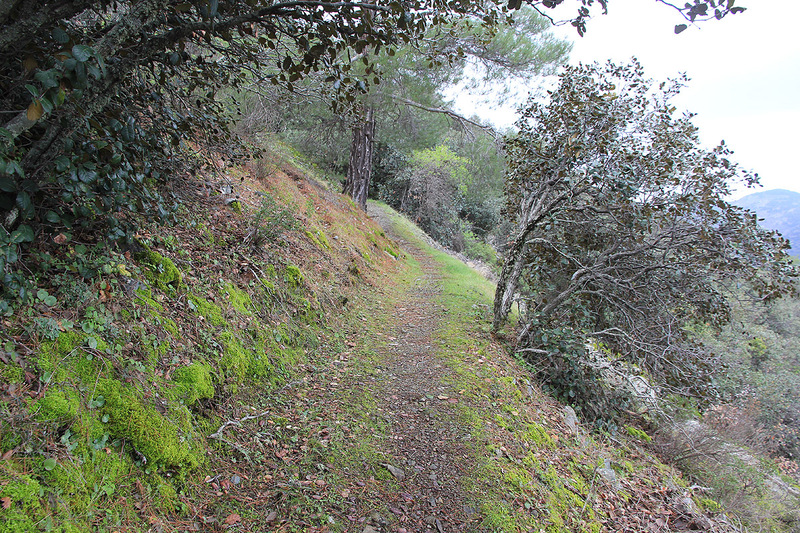 There is one small dip along the way, but the terrain is pretty easy to walk. Option 2 is to continue along E-4 until it reaches a shoulder that extends north-west from the summit. Then turn right and climb from there. 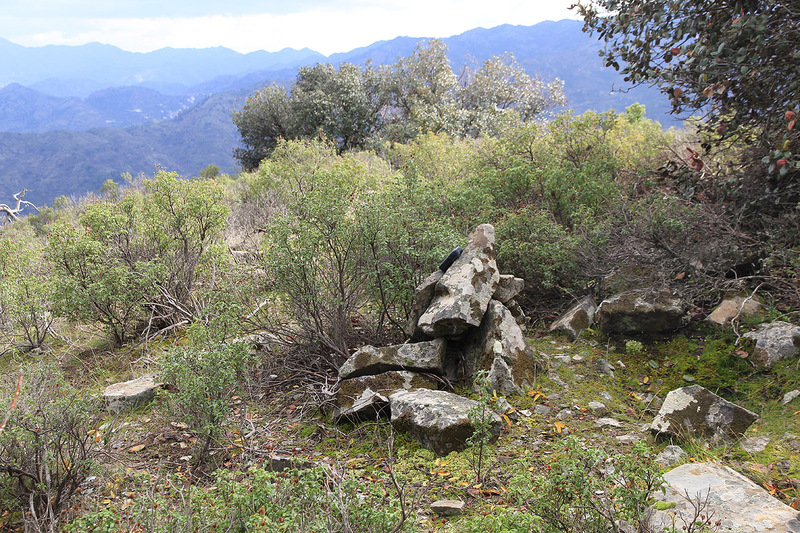 The highest point is marked with a small cairn. 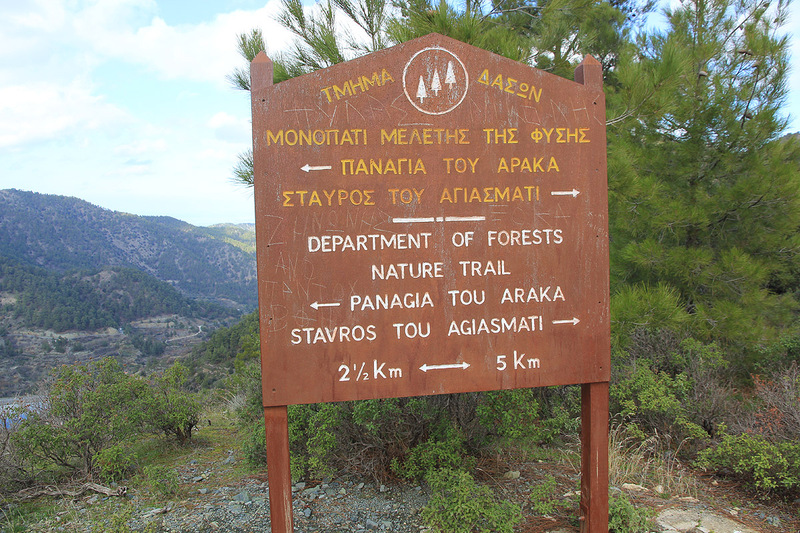 The final climb on this trip, was the north ridge of Papoutsa. I started at 1220 and left the trail at the crest with the bench, then continued along the ridge to the summit, arriving there at 1255. 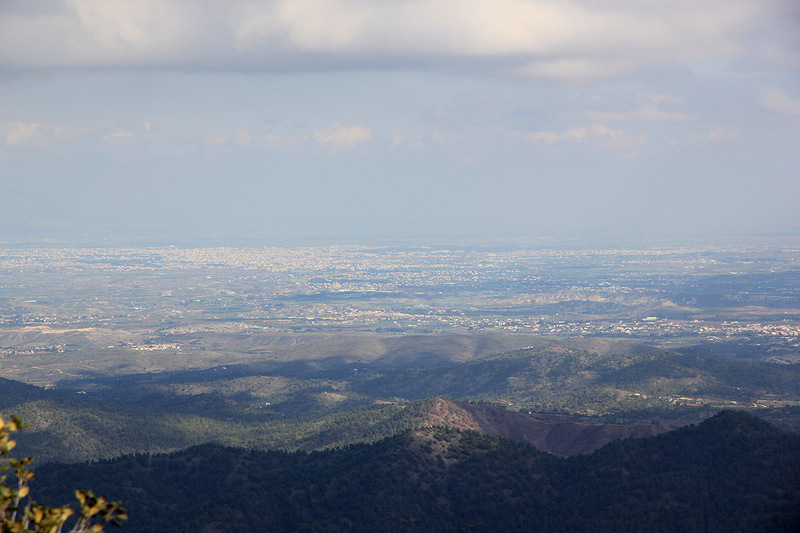 A pretty good view all the way to Nicosia. I believed the E-4 trail was pretty close to the summit and started scrambling down the loose, scree slope. Minor mistake, a better option would have been to go north-west. In this way, I ended up going downhill in unpleasant terrain to the very lowest point of the E-4 trail. The rest was easy, I followed the trail back to the bench, then onwards to the trailhead, arriving back at the car around 1335. 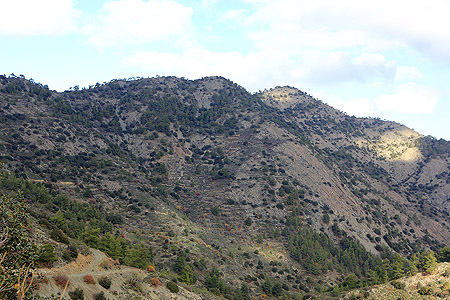 Kourtellorotsos, as seen from the road.